SFCTA Executive Director Tilly Chang moderated the discussion held at SPUR Oakland. The San Francisco Bay Area Planning and Urban Research Association (SPUR) sponsored a meeting Wednesday afternoon in their Oakland office to discuss the need for a new Transbay crossing. 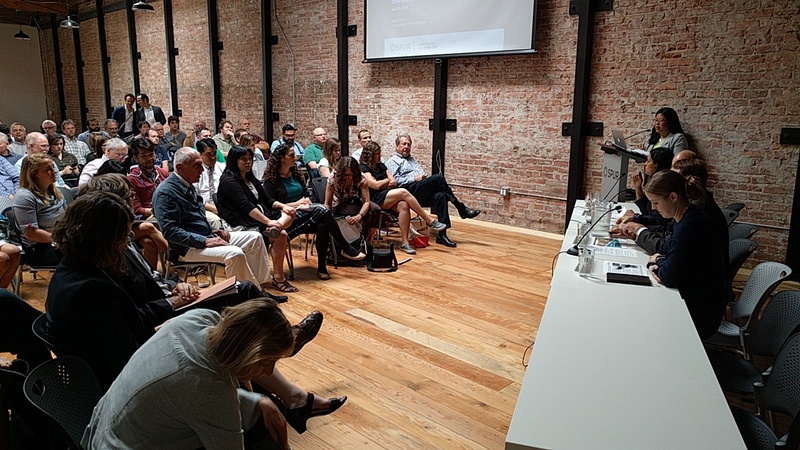 Some 60 people attended the panel discussion, which lasted roughly two hours and looked at all imaginable challenges to developing, funding and building a second rail crossing from San Francisco to Oakland. “This conversation has been going on for a very long time; often it’s been in the domain of hobbyists and advocates,” said Ratna Amin, Transportation Policy Director for SPUR. 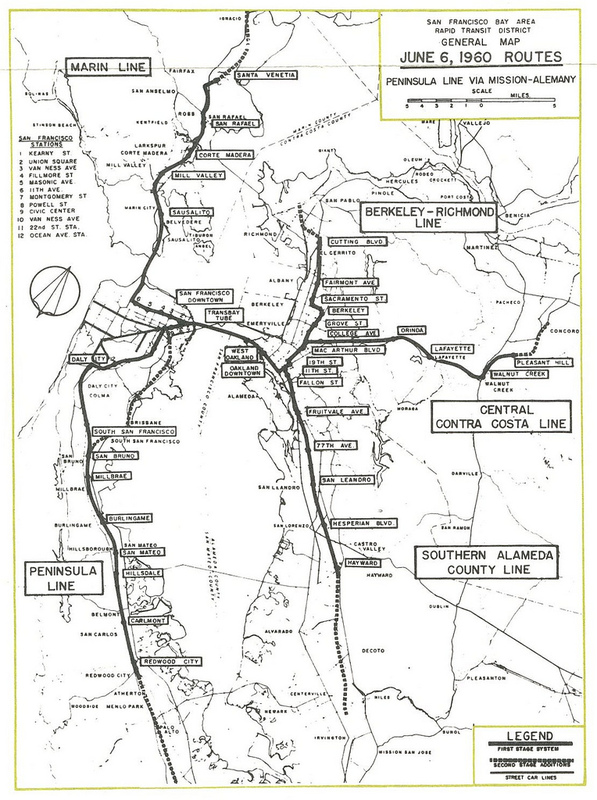 “Now is the time to move the idea of a second BART tube into the realm of a real project.” Amin presented background, with a map of the original vision for BART, which was to go to Marin as well. Then, as now, BART “was a really visionary response to growth in automobiles and congestion getting worse in the future,” she explained. The conference comes after a white paper from SPUR about what a second BART tube might look like and where it could run. But the conference dug deeper into some of the pragmatic questions, such as how to make sure such a large project doesn’t suffer the same cost overruns and embarrassments of the new eastern span of the Bay Bridge. With that kind of a record globally, what hope would a $10 billion Transbay tube project have not to run over budget and behind schedule? Peloquin gave a number of suggestions, among them making sure the project is administered by a distinct agency whose only task is to get it done on time and on budget. How is this going to get paid for? The state, according to Kate White, Deputy Secretary for Environmental Policy and Housing Coordination at the California State Transportation Agency said the tube “absolutely needs to be a centerpiece of the state rail plan… we do have significant cap and trade dollars going to transit and rail from the state.” Of course, exactly how much that would be and getting the legislature to actually allocate cap and trade funds for a BART tube (or anything else) can be tricky. The panelist also discussed how drilling technology has improved and, in all likelihood, a new tube would be bore tunneled, rather than dropped into the Bay like the current tube was built in the 1970s. That said, Ellen Smith, Manager of Strategic and Policy Planning for BART, pointed out that they also are working on short term solutions. For example, by offering discounts for people to take a later train, peak loads can be thinned. “We just want to get some people to wait 20 minutes,” she explained, which can relieve some strain when ridership is at its maximum. Echoed throughout the conference: this isn’t a question of “if” the area needs a second crossing. It’s a question of how to build it. “At some point the first tube will need rehabilitated or even replaced, so we need a second tube. We need a second tube,” said Smith. Roger and JGEL — Thank you for reporting on this important event. I noticed that there were several more panelists this time than at SPUR’s February presentation, which indicates increased institutional support. As a region we need a second crossing, we need connectivity with state rail systems, and we need guidance on how to get there. I appreciate SPUR and Ratna Amin’s leadership on this important issue. Yawn. Second tube dreamed about forever… but the Bay Area can’t seem to manage existing transit, it’s a huge financial black hole. If MTC and Heminger are remotely involved, avoid it like the plague. Current power brokers in the Bay Area need to be kept far away from this type mega-project. While there are many good routing options on the SF side (Mission Bay, under 3rd St, Geary), on the Oakland side, things are less obvious. One area that hasn’t gotten much attention is improving the I-80 corridor. If you’re an I80 commuter, your best bet is to switch to BART at El Cerrito Del Norte. If you compare straight transit time, BART takes 31 mins to Embarcadero while driving with no traffic takes 16 mins. BART already has a 15 minute disadvantage which grows by another 10 mins if you factor in exiting I80 and parking. For BART to be competitive on time, traffic must slow drivers down by at least 20 mins over a 14 mile segment. 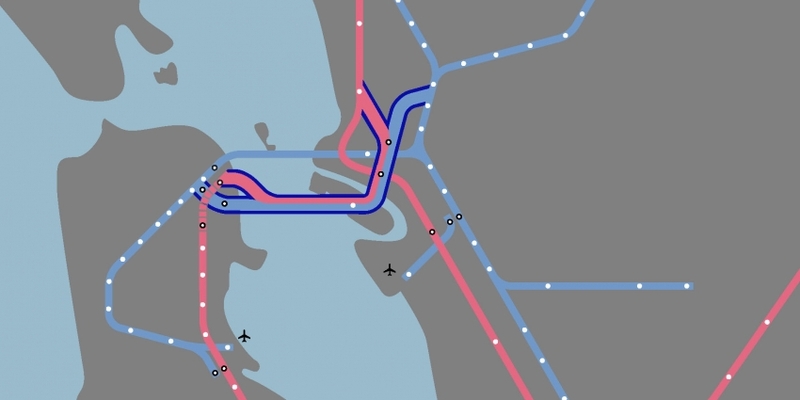 I’d claim that 2nd BART tube, should be matched up to a second line roughly paralleling I-80, but one that skips the “Berkeley Detour” and “Oakland Wye”, but instead hits Emeryville Amtrak before heading under the bay. Getting travel time comparable to driving (say avg of ~40mph) is one reason for Caltrain Baby Bullet’s success. I can’t wait for this to be built and hopefully it will be built within our lifetimes. This could revolutionize public transit in the Bay Area and especially with San Francisco because they can become a part of the larger overall rail network. A second tube would be nice but it’s possible to greatly improve BART’s capacity much cheaper by building a second line on the SF side. The key point is that the tube’s usage is currently limited by loading/unloading time. The tube itself at peak times is running at about one-quarter theoretical maximum capacity based on emergency stopping time. Building a second downtown SF line, either under the current one or on Mission Street, would double tube usage. There are other factors too, such as signalling and number of available cars, but those are comparatively easy to address. The East Bay side is less of a constraint because it already has fan-out once you’re past the West Oakland station. If West Oakland dwell time is still a constraint it could be addressed trivially by having half the trains skip that station. Furthermore, a second tube would require a second SF line too, or be useless. Since we have to build the second SF line anyway, let’s do that first and then pause and see if we still need another tube. @Jef Poskanzer: Very nice ideas. I’m in favor of building more tubes. Yesterday. The reason BART is not a 24×7 system is because our parents were cheap. Let’s not make the same mistake again. Big city populations are going up. As they should. RE: Caltrain’s success. Without a doubt the BB really cuts down on the travel time between SF and SJ, but only for those folks who live nearby each station. Sadly, the travel time to get to Caltrain in the city is still painstakingly long if you live anywhere outside of SOMA/MB. Outer Richmond to Caltrain takes about an hour. If you miss your connection at Caltrain then you’re talking several hours to get to SJ. A no brainer is BART under Geary and 19th Ave to Daly City. Rapid transit connections from the west side of town should be a priority rather than second or third thought. MUNI wants to spend upwards of $3B to put the M line underground from West Portal to SFSU which will be a horribly expensive move that will generate no new riders and only save a few minutes of travel time. Put those dollars toward a BART extension in the city. Wiener, you reading this? I’m still waiting for your fabulous subway plan to be revealed. well, it is 22 minutes from Glen Park to Millbrae Caltrain, which also cuts 17 minutes off the southbound trip to points south of Millbrae…. Are you completely insane? Do you take inventory on what’s happening right now, this minute, ever?!? I started going to work an hour later, arriving in SF at 10 am when you changed your schedule last September, leaving Concord commuters in the dust!! No seats, ever! There is no ‘peak’ commute time anymore. Every train I’m ever on is standing room only from Pleasant Hill on. It’s just rude. This is not hop on/hop off downtown commuting. Making people stand for an hour, with time added on for medical/police emergencies is just plain rude. Doesn’t the SPUR map above do almost exactly what you’re suggesting? It’s shown as an extension of Caltrain rather than a new BART line, but that’s appropriate given that the corridor already has standard gauge tracks. You’ll need to add passenger only tracks to the corridor, electrify them, and grade seperate the crossings, but it would still come out cheaper than a new BART line. And you could extend it past Richmond up to Hercules and possible Martinez, thus avoiding the need for a BART extension in West Contra Costa. Nice idea for a parallel line. I suspect a second tube to Mission is not as useful to increase capacity as people hope. If it gets build, probably 75% of people will stick with Market St and 25% will use Mission Bay at best. So the capacity may increase by 1/3. I am skeptical that 24×7 BART is such a big deal. It is nice to have but does it worth building another tube just so some people can ride in the midnight? Bus seems much more practical alternative. Plus SF is not quite a 24 hours city anyway. I live in Parkside. It’s just easier for me to drive to SJ than deal with getting to Caltrain either via MUNI or MUNI/BART combo. Now, if I the option of hopping on a BART train at Taraval/19th and 20 minutes later catch Caltrain at Millbrae that would be a plus for me and for thousands of other commuters on this side of Twin Peaks. @tungwaiyip: Bars. How come I don’t stay later? Gotta catch the last train. Sorry, not riding the bus at that hour. Can’t have a 24 hour city without 24 hour transportation. Practical? That’s money talk. The same mistakes our parents made. Build it and they will come. We embark on a multi-billion dollar infrastructure project so that people can stay late in bars? I don’t think this is an important objective. I came from Hong Kong. The MTR system has 10 times the ridership of BART and they don’t run overnight. San Francisco by and large shut down after 10pm. Hong Kong is lot more a 24 hours city. The buses keep the city alive. I have no problem going to most part of the city any hour of the day by bus. Thank you. You are of course correct. One last thing. Can you provide a link to the acceptable reasons to ride BART? I could not find it on the BART website. While I was looking I did find the #1 most frequently asked question on the BART FAQs. I will let you use your Google foo to figure that out on your own. I had no idea that Hong Kong shuts down at 10:00 PM. Sorry if that had a detrimental impact on your upbringing. Next time I’m in SF after 10:00 PM I will think of you. Oh. Wait. That’s today! Your reply is mix up. Let me clarify. – HK MTR operates from about 5am – 1am. – HK is a 24 hours city. Lots of people are on the street. Restaurants are busy late into the night. 24 hours convenient stores are everywhere. – Bus service provide city wide coverage 24 hours. – Most San Francisco restaurants finish serving their last patron around 10pm. – Outside of some hotspots, most commercial area are deserted at late hours. I understand you enjoy SF at night. But the nightlife here is just lame compare to other cities. It does not have any detrimental impact on me. San Francisco is a very healthy city in comparison, which is the way I like it. Also I wonder if building the second tube will bring really 24 hours service. The best it can do is to allow a rotating maintenance schedule split 50/50 between the two tunnels. How do you schedule a 24 hours service on Market if the tunnel have to shut down 50% of time? Sounds like the second tunnel will be using different rail gauge so you cannot just run the train there as an alternate route. Even if you can, it will probably add 20 minutes travel time, which make the service unpredictable and unreliable. The answer for late night service is really bus. No point to wait 20 years for a second tube to get built. Late night bus can start any time and at a small fraction of the cost. They already stay late in bars. We embark on this project so they don’t drive home drunk. Which is probably less of a problem in Hong Kong. Do employees working shifts past the MTR have a 30-40 mile bus ride home? If I recall correctly the tube currently runs 23 trains per hour per directions at peak. Four times that is 92 tphpd. That is more than double the frequency of the most frequent subways in the world. “Theoretical” capacity indeed. Signalling is not exactly easy, when you’re trying to cram 40+ tph worth of several lines on different branches into one track per direction. Different delays on each line means the trains are really out of sync when they arrive at the merge point. Trying to maintain headways on the trunk then is not trivial and eats up capacity. There are two other factors: Capacity of electrical systems (which is admittedly probably easier than building new lines), and safety regulations. Supposedly only three trains per direction are permitted to be in the tube at the same time. Which, if we assume that trains take 6 min through the tube means 40 tphpd max. IF everything goes perfectly, which it won’t, so effective capacity would be less. But you’re right that dwell time is a big constraint. But I think considering any infrastructure solutions is premature when you still have trains that have only two doors per side. What needs to happen is. A new BART line down Geary and 19th Ave., BART line down Lakshore. and they’re connected by the 2nd tube, along with Dublin and Fremont trains. That alignment up there is awful. And it shouldn’t even be a tube, it should be a tunnel under the Bay floor. Thats cheaper. I like the idea (buried deep in the presentation) of phasing things, i.e., building a new functional line in SF first (presumably out Geary), then build a new bay crossing later. This has been talked about for decades. I thought Seattle took forever to get moving but you guys in the Bay Area take the cake. 30 years from idea to construction on HSR. The new TBT was needed 5 years ago.